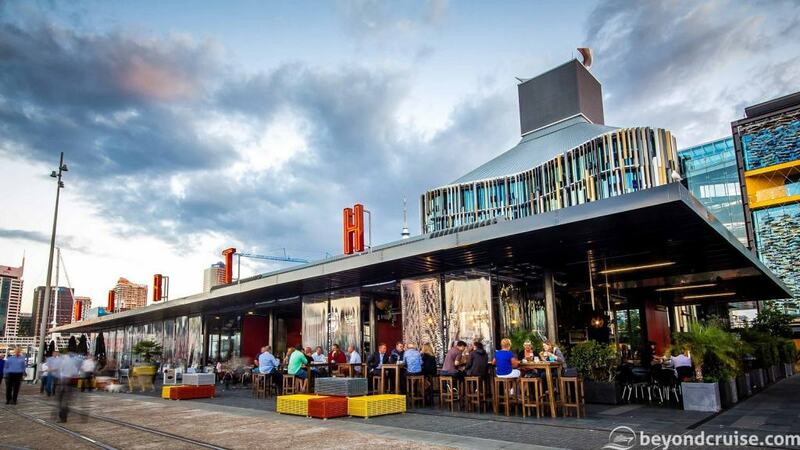 Port Call: What to do in Auckland for a day? Shore excursions and tips. 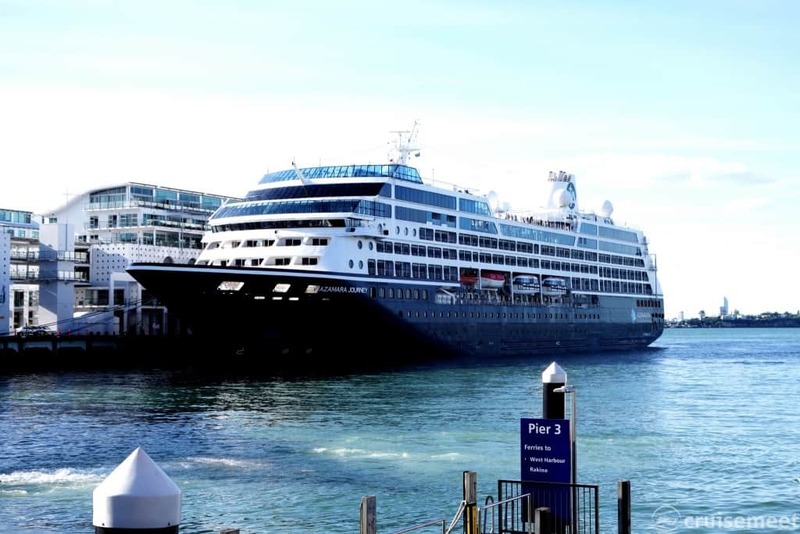 Auckland’s cruise terminal lands you right in the heart of the city. It’s the perfect cruise port to stay in and explore on your own. If you want to book a shore excursion, there are some great tours on offer that show off the best, and more remote, natural wonders New Zealand has to offer. Walk up Queen Street, the main street in the CBD and check out the shops along the way. 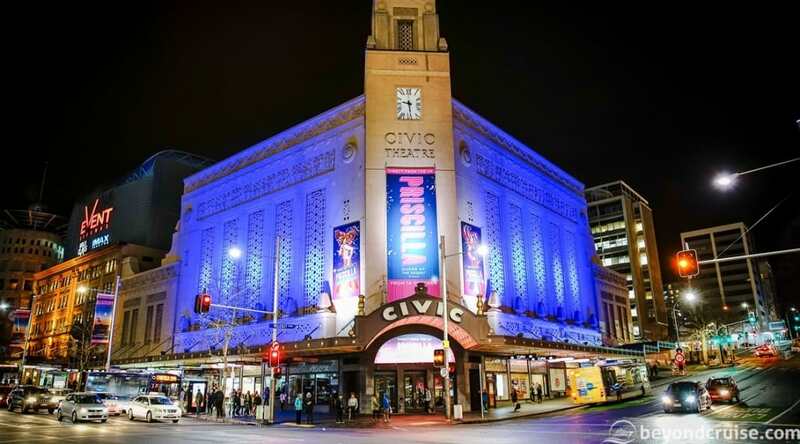 A few of the main attractions you’ll walk past are the Civic Theatre which opened in 1929 and hosts theatre shows and film festivals. Further up you’ll find Aotea Square, the entrance marked by a large carved wooden arch, created by Māori sculptor, Selwyn Muru. The Town Hall also sits on the edge of the Square. For more expensive shopping tastes, check out the shops on High Street. 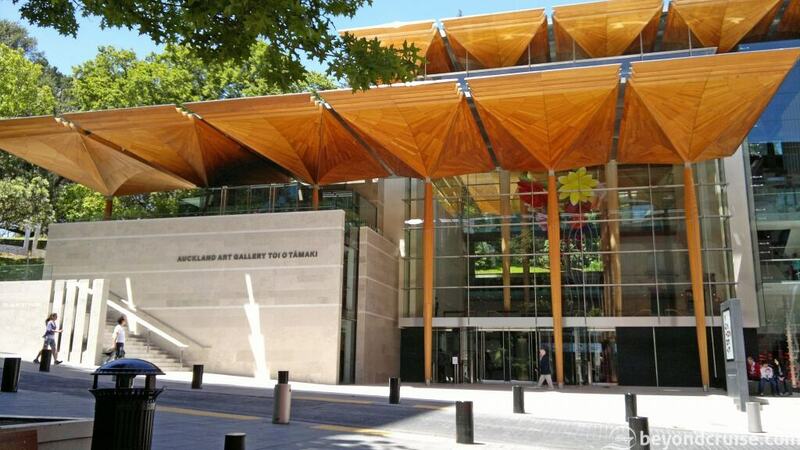 Auckland Art Gallery is a twenty-minute walk from the dock passing Queen Street on your way. The Art Gallery has a fee for international visitors but is a great place to see both contemporary and traditional Māori art as well as world-class temporary exhibitions and more. The Gallery sits on the edge of Albert Park, a beautiful park area great for a walk or picnic lunch. Wynyard Quarter and Silo Park are a short walk along the viaduct and are a great place to photograph the SkyTower or Harbour Bridge in the distance. Or grab a bite to eat at one of the many restaurants or bars. If you arrive on a Saturday, be sure to check out the market! The SkyTower, Auckland’s tallest building at 220m, is a 15-minute walk from the port (although it’s uphill and a taxi/ uber isn’t a bad option). 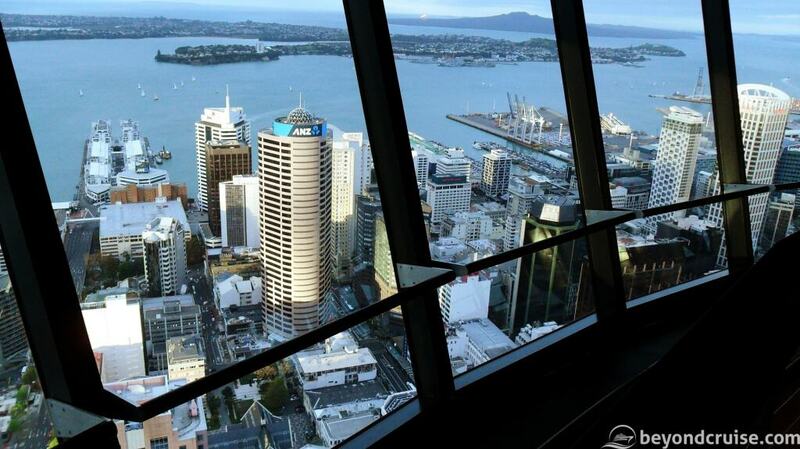 You need a ticket to visit the observation deck but anyone dining at one of the SkyTower’s restaurants (excluding the cafè) gains free entry and it’s our recommendation that you put your ticket money towards a meal in the sky! Orbit 360 Restaurant is a revolving restaurant so diners can view the city sprawled out beneath them in all directions as they dine. If you’re a foodie and have the budget, The Sugar Club is unbeatable for fine dining with Kiwi twists and cocktails to die for. Make sure you make a reservation well in advance to avoid missing out! 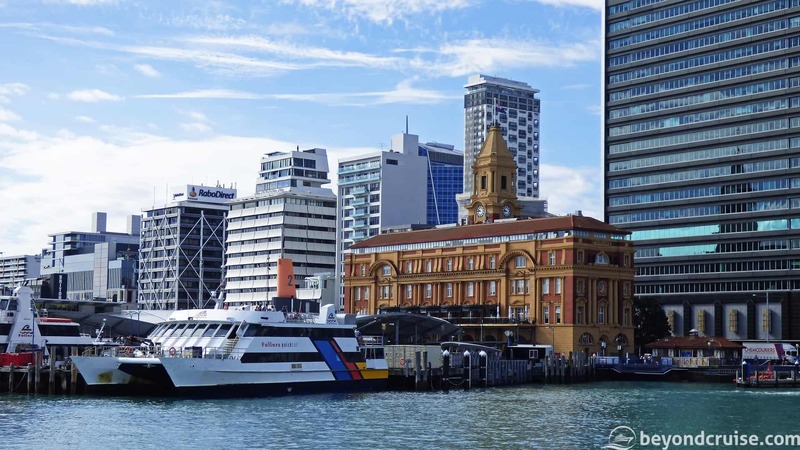 For adventurous souls or photographers, head to the ferry terminal and board a ferry across the harbour to Devonport. This small seaside village has several cafes and restaurants by the beach but it also locates you near two of Auckland’s 53 volcanoes! Mt Victoria and North Head are both dormant but offer a short hike to incredible views of Auckland’s skyline across the harbour. Mt Victoria lies in the heart of Devonport and is quite a mild walk while North Head is a 30-minute walk away along the beautiful coast before you reach the top. 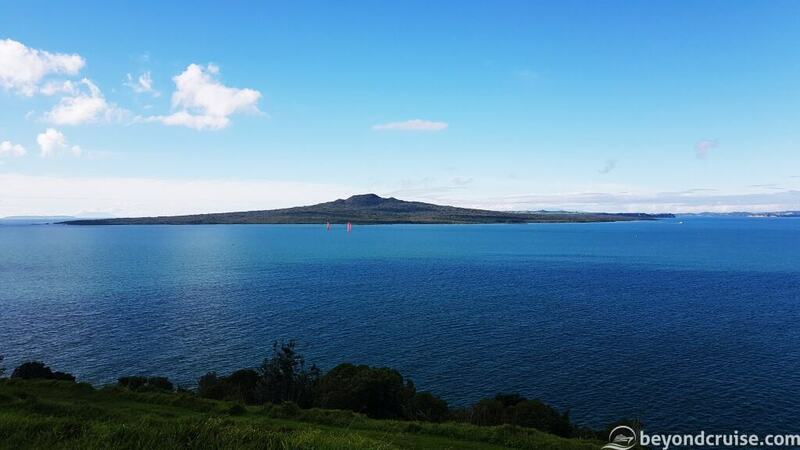 The latter also offers a quick history lesson as you explore the retired battlements that used to defend the port as well as views of Rangitoto, a volcanic island often referred to as the backdrop of Auckland due to its appearance in many popular viewpoints in the city. 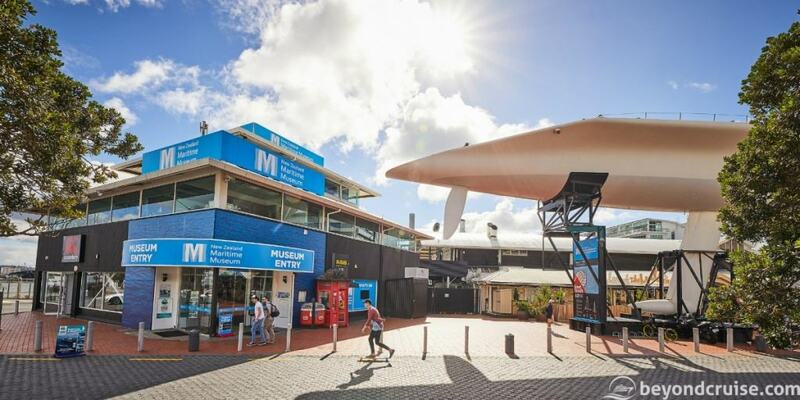 If you’re a maritime nerd, you have to visit the Auckland Maritime Museum, located a short walk from the terminal! This hop-on, hop-off bus service is a cheap and easy way to see the city of Auckland on your own. One of the two routes available departs a very short walk from the cruise terminal. 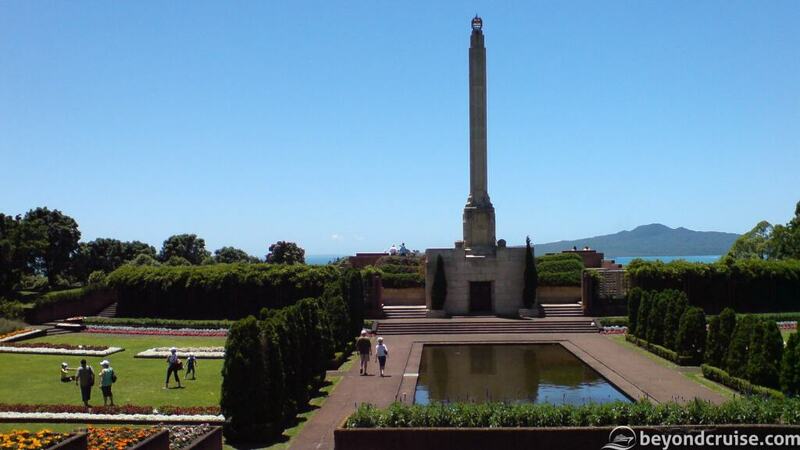 Our favourite stops on this route are Bastion Point and the Auckland Museum. Bastion Point – If you’re wanting to spend your day by the beach, hop off at Bastion Point and walk down to Mission Bay. This beach is a hive of activity with the main road full of bars, restaurants and ice cream stores. Bikes, rollerblades, kayaks, water bikes, paddleboards and more are all available for hire to explore the bay or buy some fish and chips and picnic in the park like the locals do. The beach is lovely to walk along with views of the aforementioned volcano, Rangitoto. 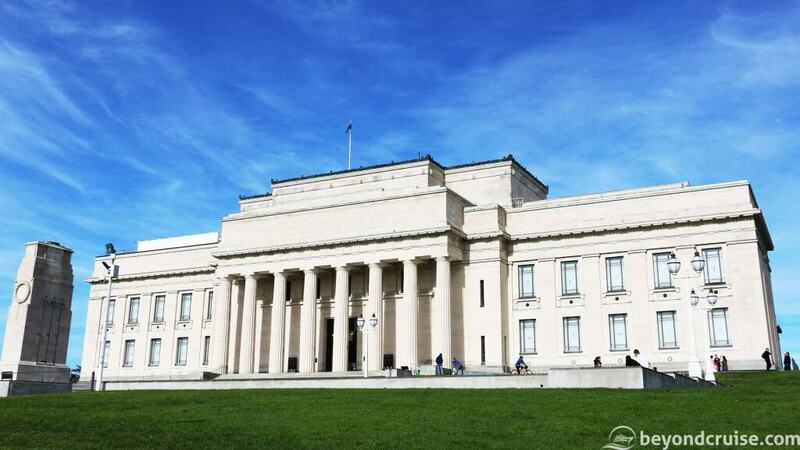 Auckland Museum – The best place in the city to experience some of New Zealand’s indigenous Māori culture. This exhibit is complete with a Māori Marae (meeting house), waka (wooden carved canoe) and many other Māori artefacts. It’s also the place to learn about New Zealand’s part in World War I & II and the country’s natural history. Domain Wintergardens – The Museum’s neoclassical architecture and war memorial make it a sight to see in itself but if that’s not your cup of tea maybe The Domain Wintergardens will be! This nearby attraction is a three-minute walk from the museum and a registered historic place. 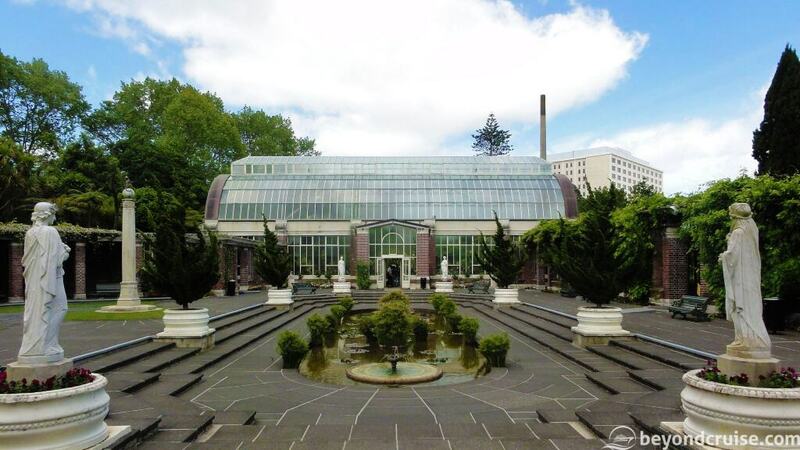 Inside of the Victorian-style glasshouse is incredible gardens of tropical plants. It’s surrounded by a stunning courtyard and native plants too. Make sure you check the seasonal opening times. This famous surf beach is known for its wild landscape and iconic landmark, Lion Rock. Like many beaches on New Zealand’s West Coast, Piha is carpeted in the black sand which derives its colour from high iron content as a result of the region’s volcanic activity. The drive to Piha is through winding bush roads and native New Zealand rainforest before finally emerging high above the beach below with panoramic coastal views. 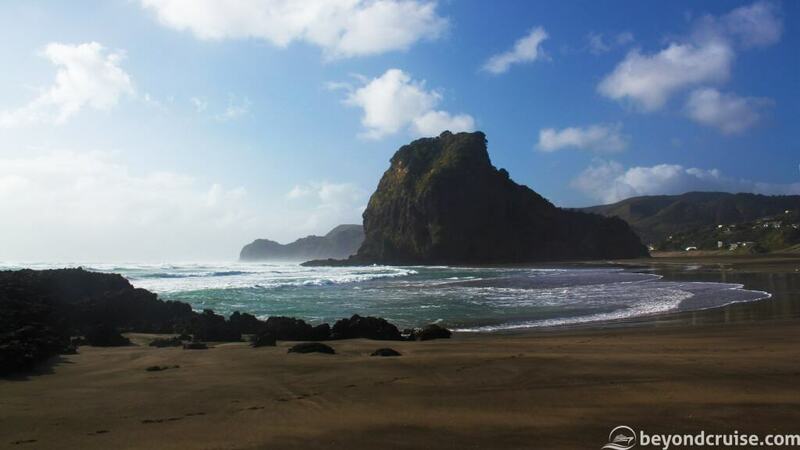 Due to Piha’s remote location, an hour out of the city, we recommend booking an official shore excursion. The small town of Waitomo is around 2.5 hours from Auckland which means it’s sensible to book an official cruise excursion if available but otherwise, Waitomo Caves are a must-see attraction in New Zealand. 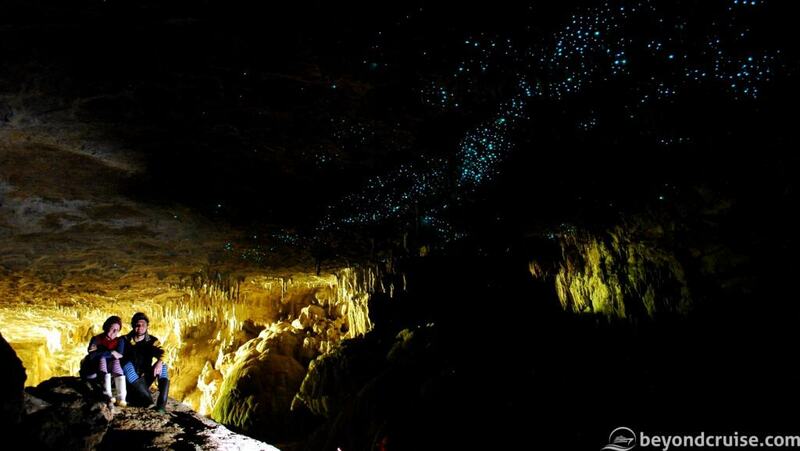 These underground caves are famous for their thousands of glow worms that light up the cave ceilings like stars in the night sky. Admire the glow worms and limestone formations as you sail through the caves on a rowboat tour. 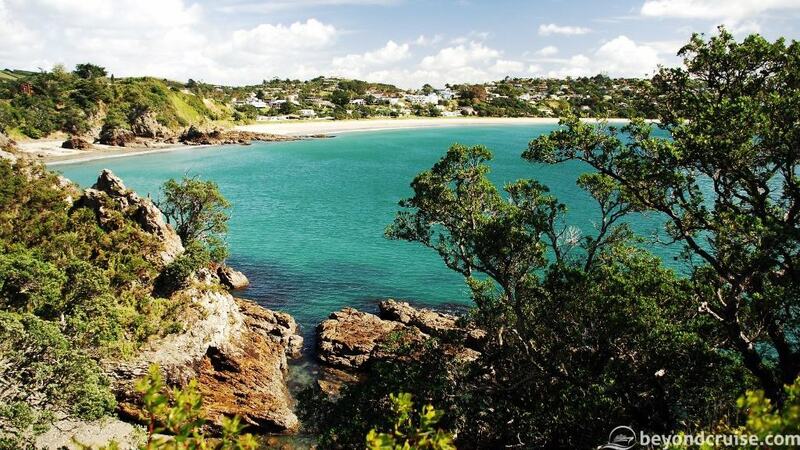 A 35-minute ferry from downtown Auckland, Waiheke Island has around 30 wineries to choose from! The island has some restaurants, cafes, shops and several beaches to choose from. We recommend visiting Oneroa beach if you’re exploring on your own. Taxis do operate on the island but the bus essentially loops around the island making it easy to sight-see and get to-and-from the ferry terminal. However, to make the most of your time and especially if you’re after some of the best New Zealand wine, we recommend booking a wine-tasting Waiheke shore excursion!